Beautiful black cat prowling on faux marble painted base. 'Black panther' is actually a black color phase of the jaguar, but this wildlife art sculpture is a real cool cat. Check out our Florida panther, mountain lion, and panther cubs! The black panther is actually a melanism color variant of the jaguar and leopard. 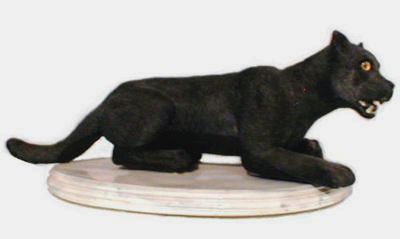 Many a dark phase of the mountain lion or puma are mistaken as 'black' panthers. While the popular leopards are native to Africa, the jaguars live in South America and range into Southern United States. The 'O' shaped spots of the nocturnal jaguar and leopard can be seen even in the black panther's fur pelt.